One of the unexpected benefits of my affair with this writing thing has been the events and the cool people I have met along the way. This includes peers, colleagues, readers, proprietors and fans. For example, at my reading last Wednesday, I was part of a panel that involved a good friend (Julie) and someone I'd never met (Connie). Both of these women had difficult (and, at times, unimaginably horrific) childhoods. Had I not chosen to follow my writing muse about 9 years ago, I would never have met them and my life would be that much less rich. Furthermore, the store proprietor, Lisa, is a great light and a beautiful person. She is all-in for promoting local and national authors. So, during the panel discussion, Lisa asked an interesting question of us. I can't quote it verbatim, but it was something like "What, if any, are the intangible benefits of writing your memoir?" I started by mentioning the time a gentleman told me that he loved to go up to the Boundary Waters every year and he also had a brother who died of cancer. We ended up having coffee and talking as I signed a book he was buying for a friend. Add to that any number of the emails or book reviews I've received, and those are the feel-goods that I hadn't planned on when I wrote the book. Julie mentioned that the book represented the end of a long road of therapy for her. The writing of it alone was therapy - getting it out into the open. She also mentioned that when the first person told her they'd purchased the book, she sort of panicked. The reality of her story being out there for the whole world to see, caused her some internal angst - at least initially. She eventually got over it and has come to realize that it was a story that needed to be told. I mentioned that I shared that feeling of concern that my words will harm someone, when that is never my intent. Many of my stories are humorous, but are not written to make anyone look bad. They are for entertainment only. But the downside of memoir is that it's all out there. Part of the process is dealing with the fact that you think your story is worth being told. Lisa asked a couple of other great questions and the three of us answered as compelled and enjoyed hearing what the others had to say. 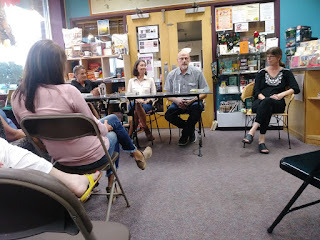 The audience was engaged and rapt which made the evening so much more than just a simple book signing. It was more like an intimate gathering of people showing up to talk listen and share. The night itself was one of those intangibles that Lisa was asking about. And I was privileged to be a part of it. I would have loved listening to your panel discussion. Lisa does ask the best questions. Happiness is sharing your book.